Whenever I start a new book, my daughters always ask me what it’s about. 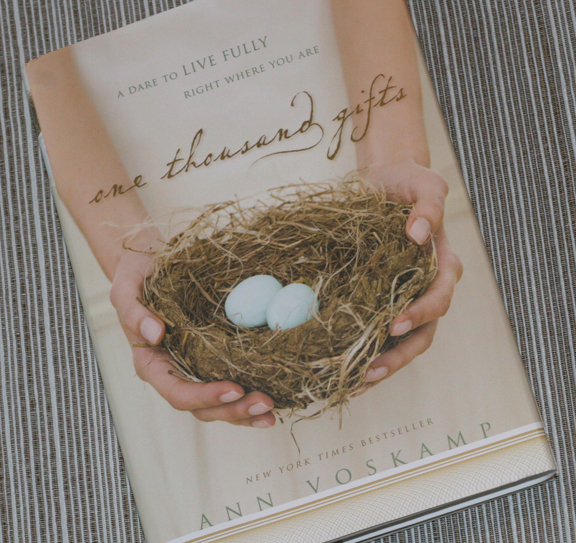 At the beginning of 2012, when I was reading this book (at left), I explained how the author started a list of 1,000 gifts from God, in hopes that it might help her live a more joyful life, and I read them some examples. Here are some of my favorites from her list: #483: hearing the sweet sound of rain falling on the roof; #490: Seeing a big, huge murmuration; #460: squishing your toes in the gushy sand by the waves; #469: going to Niagara Falls and feeling mist on your face; #454: when you have tape and scissors when you need them (very important for a crafty girl); #241: bad people who have changed; #465: getting a song in your head that you absolutely love. #472: Christmas lights in the summer that remind you of Christmas. I like to keep this notebook in plain view around the house, as it reminds me to mentally list my own blessings (I started a notebook years ago but never had the discipline to keep it going) and to be extra thankful for the life I lead and the family I am part of. 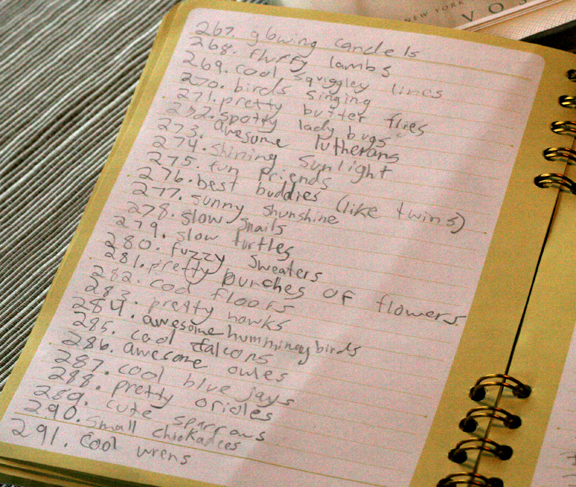 It’s fun to leaf through her notebook and read what she sees as blessings. It’s a wonderful feeling to know my own child is capable of seeing so many things in this world as blessings and it also has a way of making those things she finds amazing seem even more amazing to me. You may be wondering why I’m posting this on a site about g-free kids… Well, it struck me as interesting that she didn’t even think of writing anything about gluten-free until she got to #402: gluten-free foods; #403: gluten-free people; #404: gluten-free books. Those are the only times she says anything about GF. 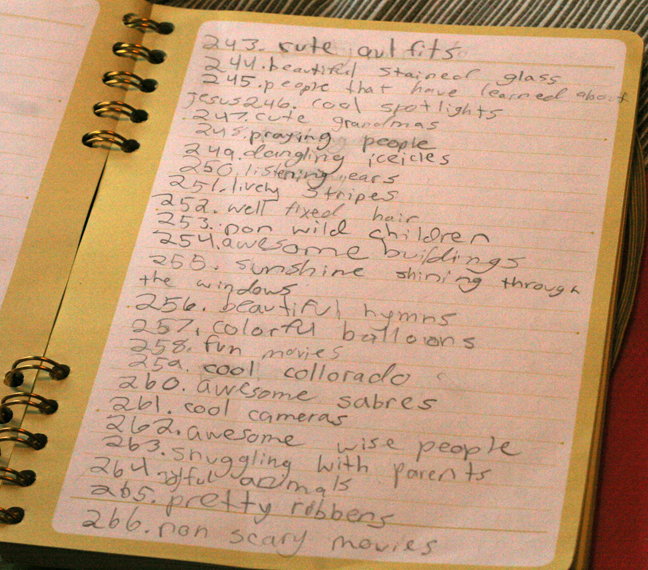 Personally, I think it’s pretty cool that she thought of over 400 things before mentioning her diet. That tells me that I’m doing a pretty good job of helping her realize she is just a normal kid, that her special diet does not need to be a main focus in her life, and that there is much, much more to life than food… Like #370: pretty irish dancing dresses, #319: laughing families, #255: sunshine shining through the windows, #430: not getting into trouble, #448: having a great imagination, #462: days when you get to relax, and #493: playing games by the fire. 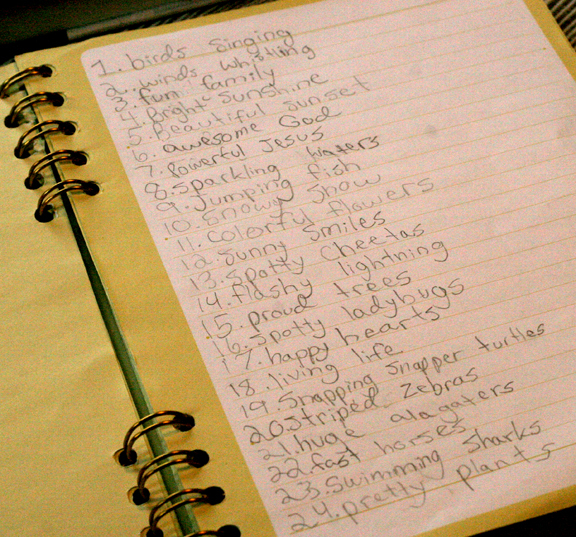 Why not have your child start a list of blessings, and (if they are on a special diet) see how many things he or she can come up with before food is mentioned? It will help them to be grateful, to keep things in perspective and let them realize that life is about so many more things than just food. What better time to start than the new year? Help your child to keep the focus on the real stuff of life… letting a kid be a kid — g-free or not. P.S. If your g-free kid needs a positive attitude adjustment about his or her diet, Mommy, What is Celiac Disease? will help your child to keep it all in perspective. That is awesome, Katie! I love that she is doing this and definitely speaks to how well you are doing at helping her adjust to gluten-free living. Many adults should stop and try to be thankful for some of these items!